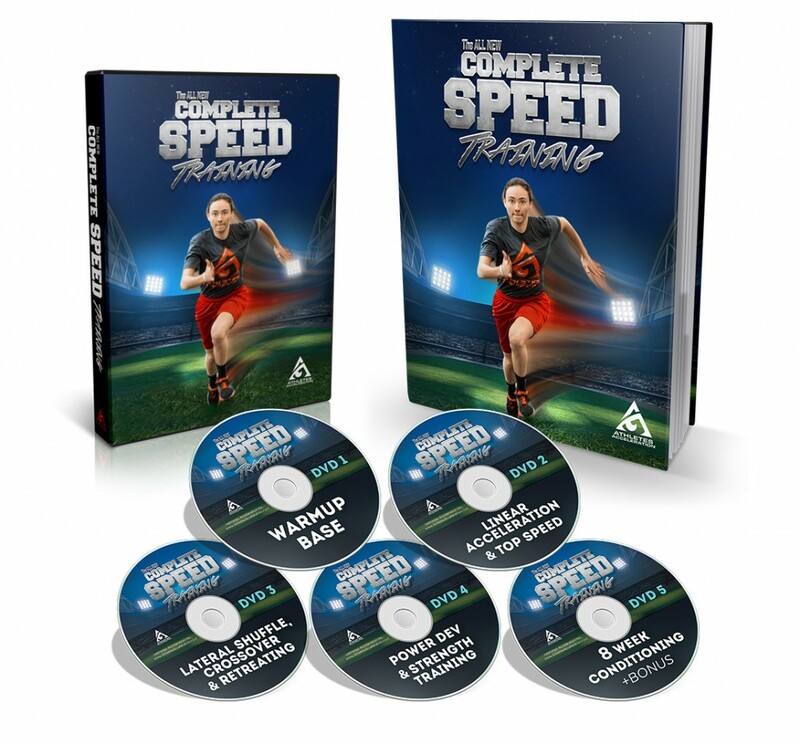 With the new release of Lee Taft’s Complete Speed Training program, I’ve gotten a few emails from people asking if his system is “hockey-specific”. In addressing this question, it’s important to note that off-ice speed correlates to on-ice speed (this well-accepted notion even has research support, so it has to be true). Of course, you need to be able to skate well in order to transfer on-ice speed developments. For instance, Matt Siniscalchi (who coaches with me at Endeavor) is very fast on land. Matt demonstrating a lateral sprint start variation at our old facilityNot so much on ice. Mastering the skill of skating is important. So is wearing the right type of skate.However, the postural control, acceleration and transition mechanics and coordinated reciprocal movement between the upper and opposite lower limbs will all definitely transfer to the ice. 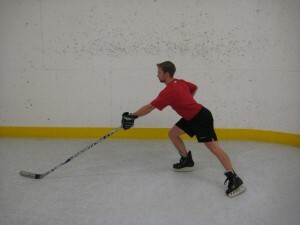 The Lateral Speed videos from Complete Speed Training are especially relevant, as the Lateral Shuffle Acceleration teaches skills relevant to transitioning from backward to forward or lateral skating using a pivot, walking the puck across the blue line, tracking players while maintaining a relatively stable position on the ice (as a penalty killer would against a player walking the puck across the blue line), and lateral starts in general. The Crossover Acceleration section will teach movement skills that transfer more to quick stops/changes of direction that emphasize a “push under” on the ice. Finally, the Retreating Skills sections provides a great look at a lot of the other transitional movements, such as back pedaling and then opening up and sprinting in the same direction (as a defenseman may do if a breakout is coming at them faster than they can accommodate skating backwards alone). All of these movement qualities can be significantly improved off the ice, which will make transitioning them on the ice that much easier. From a coaching perspective, one of my favorite features of the program is listening to Lee’s coaching cues. It’s not only important to hear what he’s saying to make quick changes in the mechanics of his athletes, it’s important to note what he’s not saying. The cues are short, simple, and effective. He’s not overwhelming the athletes with information (as I’m prone to), but he uses the least amount of explanation to deliver the great impact on performance. There’s a lesson in that for all of us! 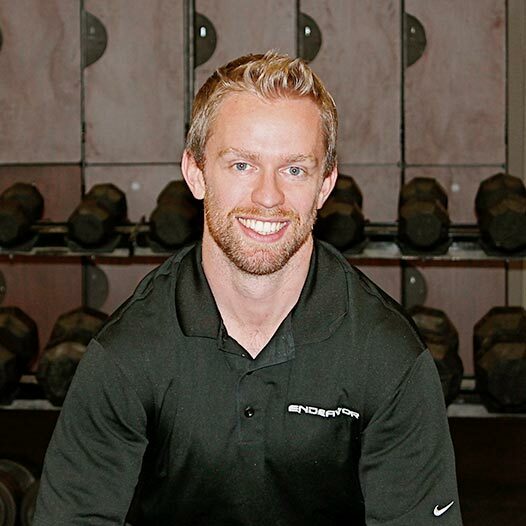 To supplement the great off-ice speed training information in Lee’s Complete Speed Training, today’s Thursday Throwback from 2012 highlights three on-ice power skating tips that will help your off-ice training transfer to on-ice speed improvements. Enjoy the post, and as a friendly reminder, Complete Speed Training is on sale for $100 off until tomorrow, so grab a copy while you can still save some loot! This feedback can go a long way for a lot of players, as some have simply never (or rarely) been given feedback on things they can do to improve their skating. In other cases, however, the solution to the player’s skating qualms delves deeper than simply providing a few movement cues for them to consider. This is an extremely important topic that I’ll cover in a future post, but before I cover physical limitations to optimal skating technique, I want to start by sharing some of the more basic flaws, either in practice emphasis or in execution, that players can start to work on immediately. Simply, for every player there is an optimal depth that will allow them to maximize their stride length.The pictures below are taken directly from my book Ultimate Hockey Training, and illustrate the effect that a lower skating position can have on stride length. In both pictures, the stride leg is in full extension. You can see very clearly that the stride leg travels about twice as far with the deeper skating stance than with the tall skating stance. Longer stride translates into more contact time with the ice which translates to more opportunity to generate power and forward propulsion. I frequently use this illustration off the ice when teaching younger players proper body position for squats, jump landings and other lower body movements. I’ve found that most youth players, despite their limited attention span, understand how a deeper stance can translate into faster skating, so explaining how them performing certain movements the way I want translates into faster skating helps with buy-in tremendously. 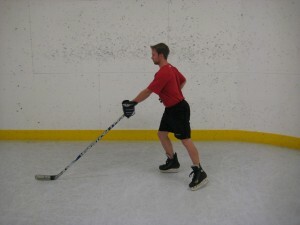 A deeper skating stance also lower the center of gravity, which makes it more difficult to be knocked off of pucks, and more likely for players to win battles in corners. Deeper isn’t always better, but it is extremely rare for a player to skate too deep. The problem is almost always in the other direction; he/she stands up too tall. This is an important point to hammer home to youth hockey players who are developing their skating habits, but this skating flaw certainly isn’t limited to the youth population. Emphasizing a deeper skating stance (not just a deeper knee bend) is an easy tip that can help a lot of players get a little bit more out of each stride. 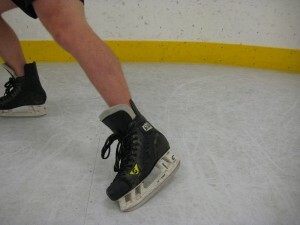 Another major area where players lose a lot of skating power potential is with the toe flick. 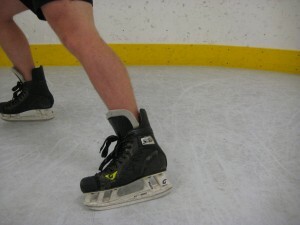 Whether it’s a forward stride, forward crossover, or backward crossover, each stride should finish with a powerful toe flick such that the skate progressively leaves the ice from heel to toe. This may seem like a relatively insignificant change, but it’s not. Everyone is capable of tremendous power potential through their calves. As an illustration of this, stand on one leg and jump up and down without bending your knees, only using movement through your ankle. When players realize that there is a relatively small amount of muscle mass accelerating their entire body off the ground, they quickly realize how much potential power they can add to each stride. Another way to illustrate this is to have someone do a max effort vertical jump off of their heels, and then again finishing off the balls of their feet (as anyone would do normally). The difference is substantial. During crossover strides, this same principle applies, but there is a bigger picture. Often times players won’t “drive under” while crossing over, they only “step over”. This “drive under” cue can go a long way in helping players accelerate through turns and get a little more push from each stride. We use this cue constantly during our transitional speed training exercises at Endeavor. This isn’t so much a skating flaw as it is an oversight in what most players practice. Forward and backward linear skating are important, as is learning to crossover, but a fundamental prerequisite to mastering all skating movements is to become comfortable on your edges. So much of the game of hockey involves transitional and curvilinear movement. The best skaters in the world demonstrate incredible balance, agility, and resilience to unexpected obstacles or contact, largely becomes of the body positions and edge control they’ve internalized. When you get some open ice, perform inside and outside edge holds, forward and backward, on one leg while maintaining optimal body positions. Push the depth of your skating stance and the angle at which you lean into the ice. Practice pivoting from forward to backward and backward to forward on one leg, maintaining proper body positions and ensuring that you don’t stand up tall during the transition. I really like this video which was posted recently by Darryl Nelson and Carrie Keil, the Strength and Conditioning Coach and Power Skating Coach, respectively, of the USA National Team Development Program, because it demonstrates a great on-ice exercise to improve inside edge comfort in a transitional pattern. There are a ton of applications of this idea, but I’ve found that these very basic concepts can go a long way in improving a player’s edge comfort, which translates into more confident and purposeful skating on the ice. These are three of the biggest areas that most players can focus on to have a huge impact on their skating technique and power. Regardless of what level you’re playing at, check yourself against these recommendations and see how you do. Almost every player has some room for improvement. If any of the above feels unnatural to you, you may have a structural or functional limitation, which I’ll discuss in more detail in a few days. Check back soon! 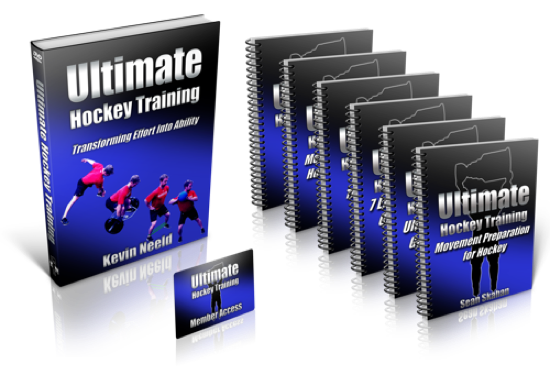 Get Ultimate Hockey Training Now!